The HyLite LED PL Lamp features optimal optical performance with 120° light dispersion, providing instant brightness with zero glares, hot spots, or shadows. Why choose the HyLite LED PL Lamp? The HyLite LED PL Lamp utilizes cutting-edge lighting technology to maximize payback and minimize maintenance costs - with a difference you can see and the payback you expect. With energy savings of 65%-90% over traditional lighting sources, near zero maintenance costs, fast payback, and delivering a low total cost of ownership, upgrading to the HyLite LED PL Lamp just makes sense. It is quick and easy to install in existing or new fixtures with its universal burning position design, compact size, and compatibility with universal power (100-277V). The HyLite LED PL Lamp is a particularly ideal energy-efficient replacement in fixtures that require directional lighting. Almost 40%-50% of the light emitted from traditional lighting sources gets trapped in the fixture, with an additional light loss of 10%-15% due to the reflector. In these cases, directional lighting significantly enhances light illumination. HyLite LED PL Lamps come with a 300° Rotatable base for precise directional lighting. HyLite LED PL Lamps are the most cost-efficient way of achieving improved quality of light with exceptional color rendering, and crisp white light coupled with superior color accuracy and consistency at substantially reduced costs of operation. With the HyLite LED PL Lamp, the hassle of replacing an entire fixture is eliminated. Save time and money with three easy steps: Simply remove the traditional bulb, bypass the ballast, and screw in the HyLite LED PL Lamp. Saving time, money, and energy has never been easier! The HyLite LED PL Lamp’s advantage over Incandescent, Halogen and CFL Bulbs: Significantly reduced energy use, relamping & disposal costs, and positive environmental impact with an energy savings of up to 90%. It is suitable for fully enclosed fixtures and provides ultra-efficient illumination with up to 95 lm/w, the highest luminous efficacy in its class. A solid-state design allows the HyLite LED PL Lamp to be used in applications with harsh environments and extreme temperatures, as well as in High Shock and High Vibration areas. With its patented and proprietary Integrated Heat Sink and Advanced Thermal Management System, the HyLite LED PL Lamp is designed to last up to 60,000 hours (this relates to about 21 years at an on-time of 8 hours/day or 17 years at an on-time of 10 hours/day) while maintaining almost 85% of its initial lumens throughout its lifespan. Compare this with the traditional lighting, which can lose 40% or more of its initial light output within the first year of operation with significant color shifts. The HyLite LED PL Lamp is available in a complete range (5W, 7W, 9W, 13W and 15W) to replace Traditional 13W to 150W Incandescent, Halogen or CFL Bulbs for use in a wide variety of applications. The HyLite LED PL Lamp’s Universal G24 Base is designed to work with both 2-pin & 4-pin G24 and Gx24 Sockets. It does not contain any lead, mercury, heavy metals, or toxic gases, and is RoHS Compliant and CE approved, for safety. 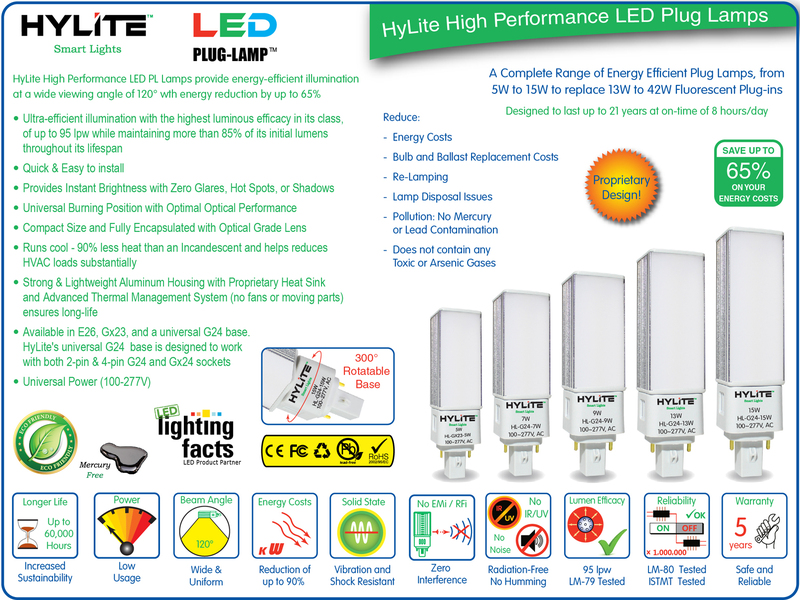 For specification sheets and more information, please visit the HyLite LED PL Lamp page here.